Happy New Year! Well, day six of it anyway. But then perhaps it’s fitting that a blog post the central tenet of which is going to be that I have not only failed to do half the things I said I was going to last year, but that I’ve also not been blogging anything like as much as I should is in fact itself late. So here we are: 2016 already. I’m not going to lie, kind of caught me by surprise this one. What about you? As you may recall, I had big plans for 2015 back in January, including the publication of a novella in October. Well, October came and went… the novella, not so much. It is still in the works though and a new, very tentative date of October 2017 (yes, ’17, that’s not a typo) has been set to a) give me enough time to finish the darn thing, and b) fit with my publisher’s schedule of fiction releases. So that’s nice. Expect a veritable cyberspace odyssey comprised of more posts about writing and links to writing (mine and other people’s), as well as some more random stuff like the above. Some of it might even be vaguely interesting… no promises though. In the meantime, know that I wish you all the very best for 2016. Carry on being nice to one another and make sure to pick up a copy of Vestigial Tales (sorry – I couldn’t resist!). 2014 is dead, long live 2015! Now that all the celebrations have died down and the hangovers have (mostly) gone away, it’s time to take a quick look back at the year past and to gaze longingly at the one yet to come. 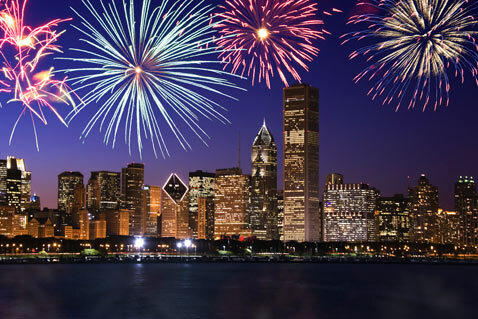 A fake-looking photo of fireworks over Chicago (I don’t know whether it’s truly fake or not. Apologies if it’s yours and it’s real!). 2014 has been a big year for me. I started this website, move out to the Windy City (which I can confirm is mighty pretty), got a new job and, of course, published a collection of my micro-fiction, Vestigial Tales. Yep, overall 2014 was pretty good to me and I want to say thanks to all of you who read, or have ever read this blog, follow my 140 character stories on Twitter, or bought a copy of Vestigial Tales. You’re the ones who made all this possible, so, um… thanks! Home sweet home: Chi-Town, the windiest of cities. While 2015 is still new and all shiny in its unspoilt packaging it’s impossible to know exactly what it has in store, yet there are a couple of exciting elements on the horizon I thought I’d share quickly with you now. Firstly, I have a short novella that I am *hoping* to kick out the door before the year is through. The tentative plan is to publish it in or around Halloween which is both soon enough it seems like a real, tangible deadline yet far enough away that we might just actually make it. Who knows? But whenever we do get the little beastie out, I plan on giving away free copies on this here very blog. So, you know… stay tuned! Secondly, I have not just one, but TWO sci-fi shorts that should also be appearing over the next few months, if all goes to plan. Exciting, no? Well it’s all relative, I suppose. Anyway, that’s it from me. A very Happy New Year to you and the bestest possible wishes of warmth and success to you and your loved ones. If 2015 is half as good as its predecessor, it’s gonna be one to keep.